Just to give you an idea, here's a shot of a large Betacam SP cassette next to a MicroMV cassette. Both can be converted to Digital File or DVD at Trevor Thurlow Productions. NEW! Betacam and Betacam SP tapes can now be transferred to Uncompressed AVI! Uncompressed uses about 100GB for 1 hour of video, vs a DV-AVI which uses 13GB for 1 hour. Price does not include USB Stick or Hard Drive. If you do not supply one, then the cost of the USB stick or Hard Drive will be added to your final total. Introduced in 1982, Betacam revolutionized the television broadcast industry. By recording video in an analog component format, Betacam offered a higher quality picture that was needed for recent (1970's/80's) broadcasting inventions (satellite broadcasting) than U-Matic or other composite recording formats could offer. 1985 saw the release of Betacam SP which, aside from reusing the old Betamax cassette shell just as the oxide Betacam had used in 1982, used metal particles to capture the image to tape, resulting in an even higher picture. Betacam SP has been the industry standard for television broadcasting since the late-1980's, and even today (2019), many TV shows and commercials that are aired in Standard-Definition still use Betacam SP. In the 1980's and 1990's many training videos and promotional videos were also shot and delivered in an edited form on Betacam to the client, along with VHS copies. Even some wedding videographers back then were using Betacam for shooting and editing wedding videos, when the standard was to shoot and edit on S-VHS or 3/4 U-matic. So if you have a wedding video, or if your company had a training or promotional video delivered to you on both Betacam and VHS, you can get your video transferred to MiniDV, computer file and DVD here at Trevor Thurlow Productions. Using a Sony UVW-1800 that has been modified to allow the machine to read FM audio tracks, and with the signal running through a ProcAmp and Timebase Corrector, Trevor Thurlow Productions can transfer your Betacam to hard drive, via Component Video, in 10-bit Uncompressed AVI or DV-AVI file format for easier access. Once on hard drive, you can access the video on any computer (and if you would like, for easier access on Mac computers the video can be in DV-MOV). 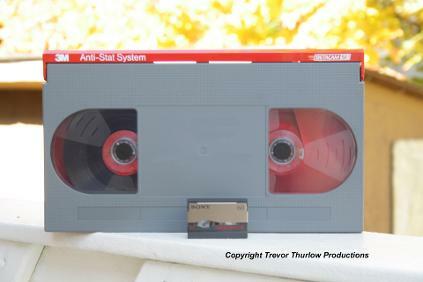 And DV has been noted by many people as offering the same quality of video as Betacam SP, so not only are you getting a Digital Video copy of your Analog tape, but you are not losing any quality! 10-bit Uncompressed AVI's will give you the highest quality video for editing or upconversion to HD (note 10-bit Uncompressed uses about 100GB/per 60 minutes of video) or conversion to other SD fomats such as DVCPRO50. Other options include putting the video onto Mini-DV tape or onto a data Blu-ray disc (although with DV-AVI's or DV-MOV's, a 25GB data Blu-Ray could only hold about 90 minutes, as 60 minutes of DV video takes about 13GB of space). Besides just putting Betacam SP material onto Hard Drive or DVD, Trevor Thurlow Productions can also do the reverse and go from video file to Betacam SP. Just ask. I've done Betacam and Betacam SP transfers for former employees of CTV who have been delighted with the quality of the transfers. Please contact us today to transfer your tapes or video file to or from Betacam SP! Both Small and Large Cassettes can be transferred! Oxide Betacam can also be transferred! *Note My setup is Windows based, so I do have some issues with Mac specific file properties, such as for example, if you want a Betacam SP tape transferred to a DVCPRO50 file I am unable to offer a DVCPRO50 QuickTime MOV file or ProRes. I can still give you a DVCPRO50 file, but it will be in the MXF format, just like you would get off of a P2 Card. Do you need extra copies? Extra Copies are only $10.